In my free time I enjoy swimming, cooking, scrap booking or getting into the RV and traveling! In my lifetime I have purchase three homes. Usually the REALTORS® are looking out for themselves and not for me. With Sherry, our needs came first before hers. We would not have our present home without the truth, honesty, and help of Sherry Light. I will never buy or sell a home again without Sherry Light. She’s honest to both the buyer AND the seller. 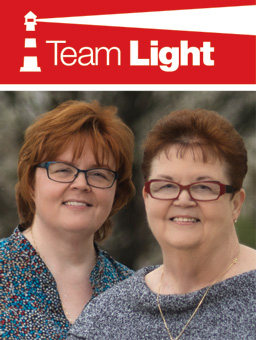 Because of her many years of experience, Sherry Light was able to find homes that met our desires and expectation. thanks to her friendly professional help, we found our retirement home. Thanks Sherry! I would like to thank Sherry for her relentless pursuit in find me just the right home that is completely accessible for my wheelchair, and within my price range. Some folks go the extra mile, but Sherry goes an extra “10 miles” for her clients and friends. sherry’s hard work and honesty make her the only agent I would ever even consider using. Sherry is very knowledgeable of the real estate market, and puts forth an all out effort for her clients. She works with her clients through the whole home sale process, from the listing to the closing.